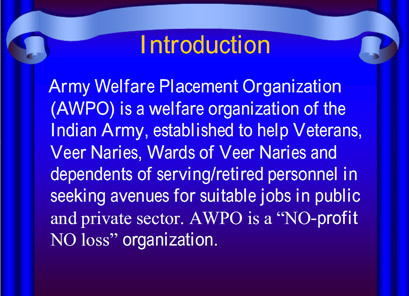 "A Welfare organisation of Indian Army"
Senior Executives / Administrators / Manager HRD / Personal / Systems / Production / Works. 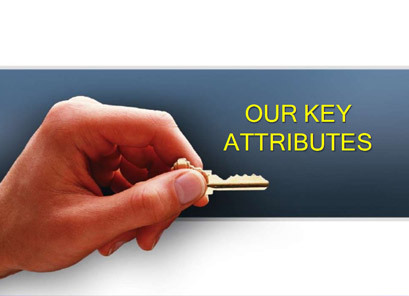 Managers - Hotel, Clubs, Estate, Project, Operations, Transport Fleet. 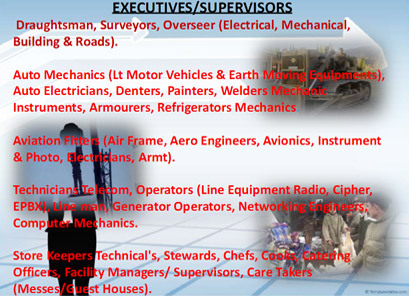 Senior Technocrats - Electrical, Mechanical, Civil, Telecommunication, Computers. 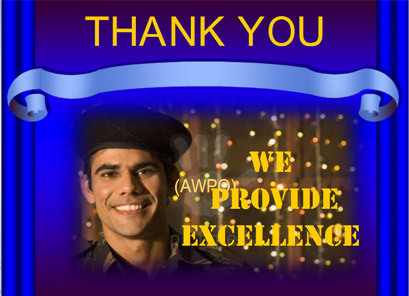 Security Officers, Food Inspectors & Preservators. 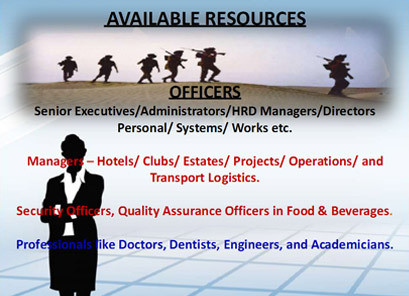 Women Officers qualified and handling - Telecommunication, Civil, IT & other Technical jobs, Administrative & Managerial Officers, Event Management, Legal appts and many such other specialised fields. Middle Level Managers - Security Officer, Transport Fleet, Communications, Estate. Supervisor - Security, Communications, Workshop, Hostel, Estate. Store-in-Charge, Fire Fighting, Computer Operator / Programmer. 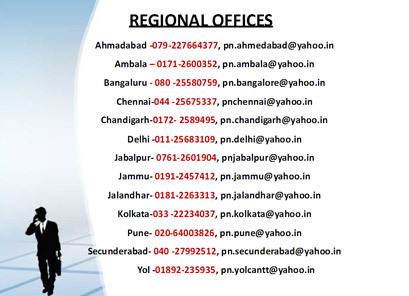 Office - Supdt, Assistant, Clerk, PA, Steno. Draughtsman / Surveyor - Trigs, Field, Auto Carto, Topo. Overseer - Electrical, Mechanical, Buildings & Roads. Mechanic - Refrigerator, Motor Vehicles, Heavy Vehicles, Instruments,Engineering Equipment, achinist. Electrician - Engineering Equipment, Motor Vehicles, Heavy Vehicles, Aviation Aero Engine / Avionics. Helio Worker, Photo Writer, Welder, Tin & Copper Smith, Brick Layer, Painter & Decorator, Limb Maker, Tool Maker, Armourer, Pattern Maker. Operator - Cipher, Radio, Line Equipment, EPABX, Generator, Line Test Recorder. Telecom Mech - Electronics Systems / Radio, Generator, Radar. 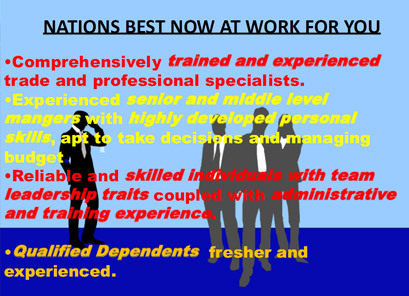 General Duties, Store - Control / Provisioning, Postal, PA / Steno Medical Trades. Assistants - Nursing, Laboratory, Blood Transfusion, X-Ray, Health, Operating Room, Special Treatment, Psychiatry, Ambulance, Dental. Radiographer, Dental Hygienist, Pharmacist, Laboratory Technician, Nursing Technical. 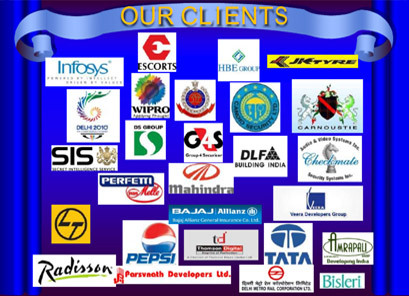 Catering - Supervisor, Staff, Cooks, Waiters, Baker, Butcher, Masalchi. Carpenter, Blacksmith, Painter, Tinsmith, Tailor, Washerman, Safaiwala, Saddler, Barber, Packer, Kennelman. Bandsman - Piper, Bugler, Drummer. Education - Teacher, Translator & Interpreter (Foreign Languages), Physical Training Instructor / Drill Instructor, Religious Teacher. Security Guards, Peons, Drivers - Heavy / Light / Recovery Vehicles, Fire Fighters, Caretakers - Messes / Guest Houses. 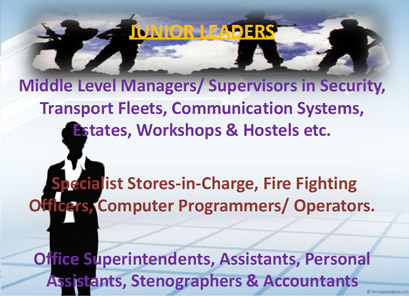 Store Keepers - Armoured Vehicles, Ammunition, General Stores, Clothing, Mechanical Transport, Signals. 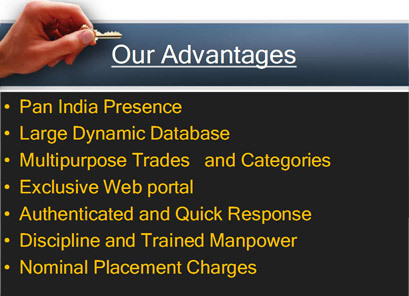 *	A large number of Ex Army personnel have ITI qualifications. 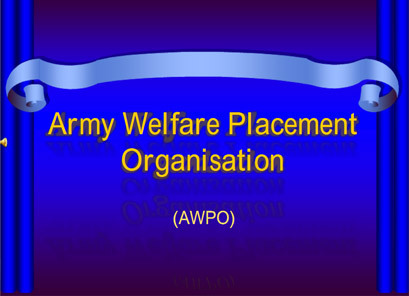 It is intimated that KSB( Deptt of Sainik Welfare and Resettlement) has given strict compliance in accepting ,the applications for various positions in their organisation,only by given due date. Any application received even after one day of due date will not be accepted. 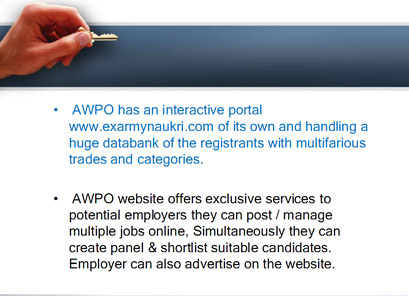 Please help us to keep your AWPO profile and contact details up-to-date and ensure that you receive, all job related communication on time. Renewal of Registration - No renewal of registration required till 3 years period, all the same, updating of contact details every year or at the time of change is compulsory. Regularly check your Inbox for Jobs and Sponsorship alerts. 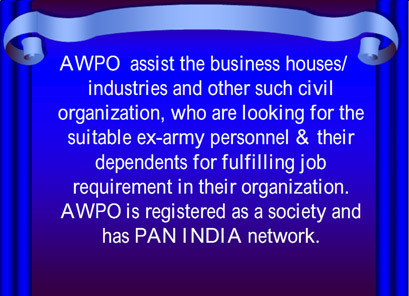 AWPO SMS job alert service is active now. To get alerts for jobs please ensure that NCPR (DND) service is de-activated on your mobile.